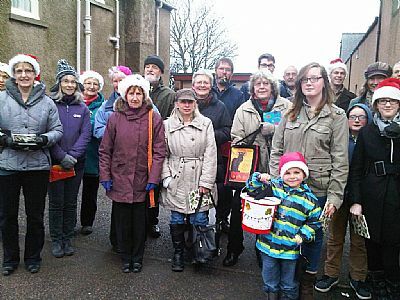 On Saturday 21 December the choir and friends sang carols in the village, commencing at 11 am in The Lawson Hospital and then onto Seaforth House, followed by singing outside Lindsay’s shop and finally in front of the Christmas tree, Main Street. The money raised was put towards new Mission Praise hymn books for the Church. Christmas Card Delivery Service - A local Christmas card delivery service ran during the month of December. Post boxes for cards were placed in various shops throughout the village as well as in the Church. The total sum of £376.07 was raised. Panto - 3 December - Oh yes it is! It's that time of year again. 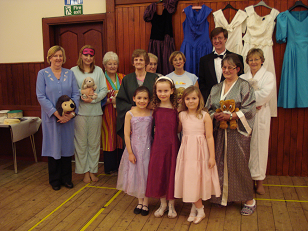 In December a group from the Church and their friends hired a bus and went to see the Panto, Sleeping Beauty. A Soup and Sweet lunch was held in Fountain Road Church Hall on Saturday 26 October in aid of India Village Ministries (IVM) and raised £410. Thank you to everyone who came along to help raise this amount. Bible Study – Promises kept - The last of our series of Bible Study (No. 9) based on the book, promises kept by Carl Lafertonwas was held on Wednesday 20 November at 7.00 pm in the Manse. Play Scheme - 7 - 9 October - The October Play Scheme was held in Fountain Road Church Hall on Monday 7 October, Tuesday 8 October and Wednesday 9 October, from 10 - 12 noon. 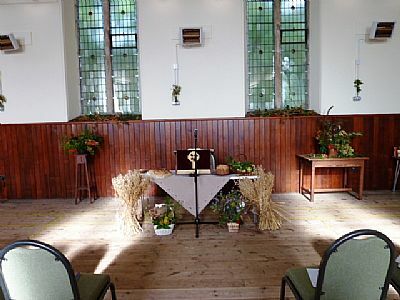 The Harvest Thanksgiving service was held on Sunday 29 September in Fountain Road Church Hall, and a group from the congregation helped to decorate the Hall on the Saturday afternoon. 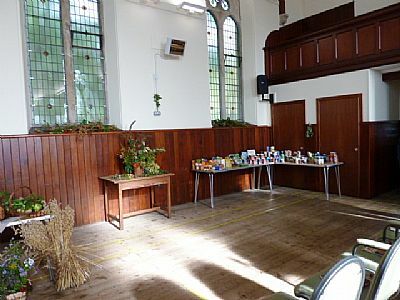 St Andrew’s Church had been asked to participate in the Blythswood Highland Foodbank Appeal. Our congregation has been asked to contribute tinned tomatoes, corned beef, long-life fruit juice, oatcakes and crackers, or any tinned meats or dried foods. As you can see from the photo the congregation responded generously to the appeal and also asked friends and work colleagues to contribute towards the appeal. Highland Food Bank was launched in October 2005 and works in collaboration with around 50 partner agencies (both statutory and voluntary organisations) that refer their clients who for various reasons are facing financial crisis and are unable to buy food for themselves. These clients are either given a voucher which they can bring to the Food Bank Centre in Inverness to exchange for non-perishable food items, or else (if they live outside Inverness or are facing a crisis on a day when the Centre is not open are provided by the partner agency with an ‘Emergency Food Box’. Each client receives for themselves and for their family (where appropriate) a three-day supply of food together with suggested nutritious recipes to help them make best use of the food. The intention is that this three-day period should provide the client a ‘breathing space’ enabling them to find help to put their finances on a more stable basis. However, it is recognised that some clients may require further vouchers and each client is limited to a maximum of three vouchers within a given space of time. St Andrew's Fete - 17 August – A very successful Fete was held on Saturday 17 August at 11 a.m. in Fountain Road Church Hall and raised the magnificent sum of nearly £1,900. Summer Play Scheme July 2013 - A Summer Play Scheme was held again this year in Fountain Road Hall, Golspie on Mon - Wed for the first three weeks in July. India Village Ministries - Friday 26 July Suresh from India Village Ministries came to stay at the Manse for a couple of days in July. 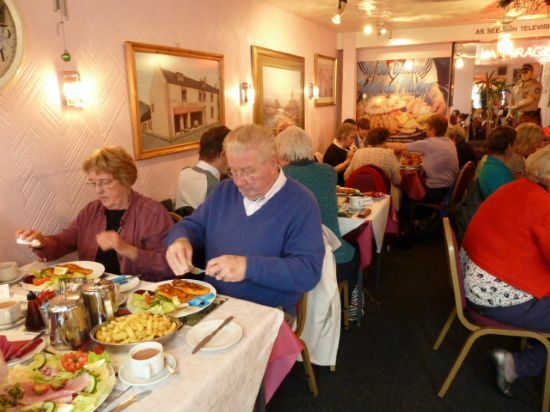 A social evening was held on Friday 26 July in Fountain Road Church Hall at 7:00 p.m. The choir sang and Suresh gave an up to date presentation on the work of IVM, followed by tea and home baking served in the large hall. It was also an opportunity to purchase clothes left over from the two fashion shows held earlier in the year. All money from the sale of the clothes was donated to IVM. 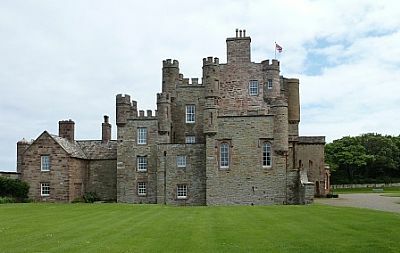 Church day trip to Castle of Mey - Saturday 29 June - A day trip was held on Saturday 29 June to visit the Castle of Mey. 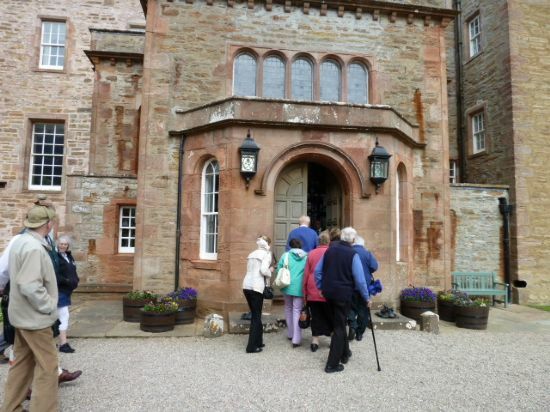 A group of 30 people from the congregation and their friends boarded the coach in Golspie and set off to enjoy a lovely day out. The sun shone down on us as we sang our way along to the Castle. 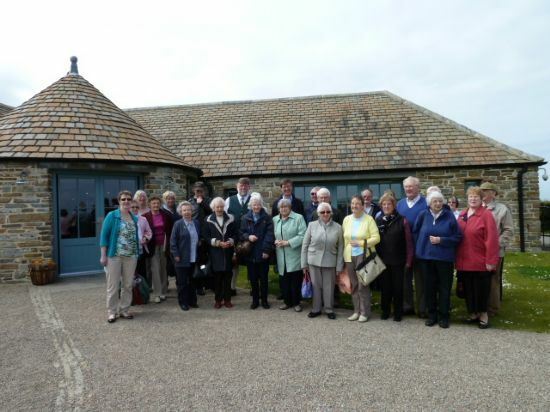 After a very enjoyable tour of the Castle and Gardens, lunch was enjoyed by all in the tearoom and then everyone joined the coach to travel onto John O’Groats, stopping on the way to visit Canisbay Church. Canisbay Church is the most northerly Parish Church in Mainland Scotland. The walls in the entrance of the Church show photographs of the Queen Mother with various Minsters who have preached there over the years. 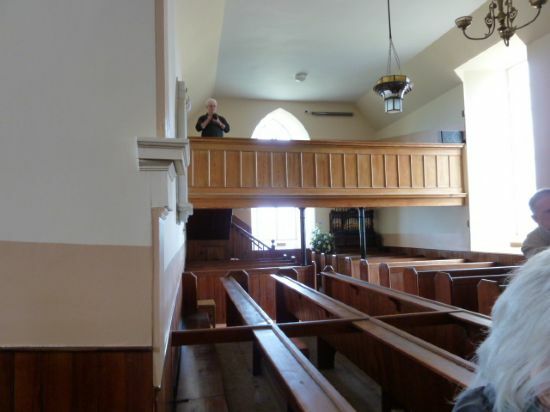 The Rev John Sterrett climbed into the pulpit and encouraged us all to sing The Lord ’s my Shepherd to the tune of Orlington, which sounded wonderful in such a lovely old Church. Gift Day - Saturday 4 May 2013 - This year Gift Day was held on Saturday 4 May from 10:00am - 12:30pm in Fountain Road Church Hall. Choir Tuesday 5 March 2013 - On Tuesday 5 March an informal party was held after choir practice in Fountain Road Hall. Alex a member of the Choir was leaving to take up a new position as a dentist in Stirling. Bea Mackay presented with him a leaving card signed by all the choir members. We wish Alex and his family God’s Blessings in his new life in the south and hope we will meet him again when he comes back on holiday to Golspie. Fashion Show - 22 March 2013 - On Friday 22 March St Andrew’s Church held a Fashion Show to raise funds for the India Village Ministries. 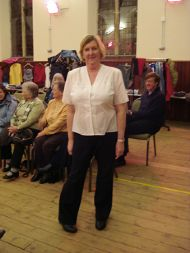 The Fashion Show was held in Fountain Road Hall and began at half past seven. All guests were greeted with glass of wine or juice as well as being offered nibbles and chocolates. The show was set to go through the seasons and started with winter – the cold spring weather we were experiencing was the motivator to do things in reverse order. It was hoped that by end of the show we would all be looking forward to lovely spring and summer weather. 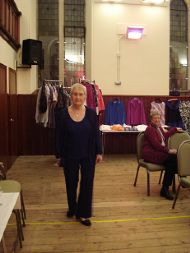 Not only were the clothes modelled but also displayed around the hall. After the show the models came out to sell their outfits and help with the sale of the other clothes. 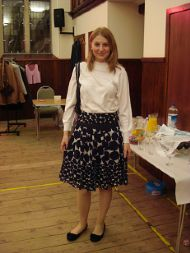 As you can see by the photos there was a rich and varied selection of models and clothes. 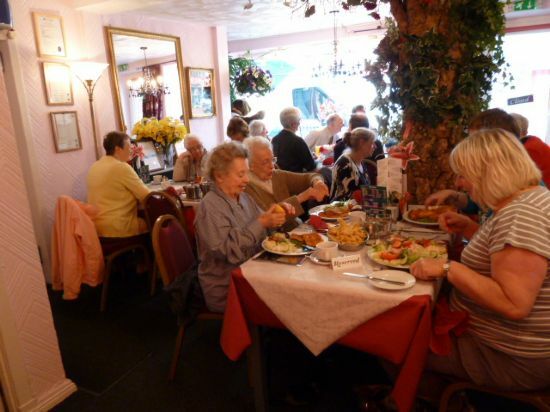 We raised £650 on the night and by the following day donations increased this to nearly £800. 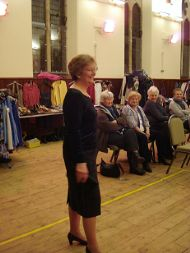 Many thanks were given to the models and the guests who came out on such a dreadful night and also to the organisers. By the end of the night everyone was fortunate enough to catch the models before they popped off to bed. It was very nice to see the junior members of the church taking part in a church activity. 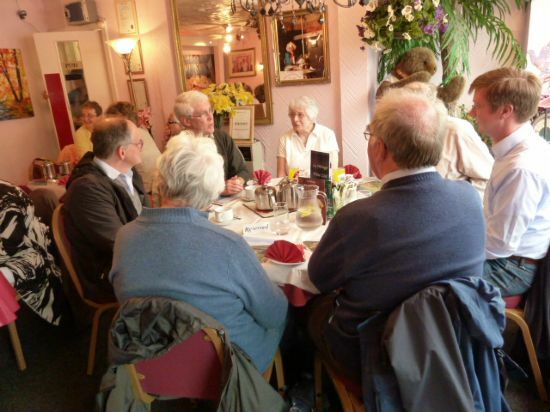 Yet again we were so pleased at the numbers who came along to join in our fellowship. Good Friday 29 March - Service in St Andrew’s Church, 7:00pm. Easter Day 31 March - Biblical Garden Service: 8:30am. 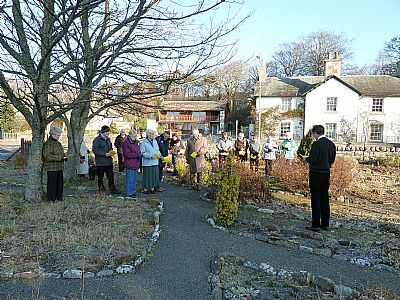 Although the clocks had been put forward an hour, the sun was out to greet everyone and passers by were able to join in the hymns, ‘Thine be the Glory’ and ‘What a friend we have in Jesus’. Easter Breakfast - 9:00am Fountain Road Hall. Easter Communion Service with Choir - 11:00am St Andrew’s Church. Evening Communion - 6:30pm St Andrew’s Church. Thanksgiving Service followed by refreshments - 7:00pm St Andrew’s Church. 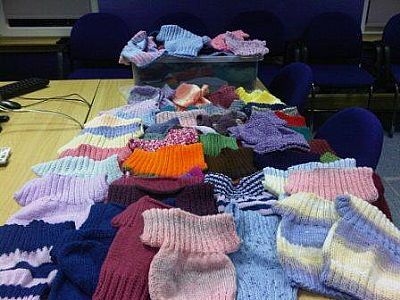 Fish & Chip Babies Appeal - There is now an appeal for knitters to provide cardigans, bonnets and squares for blankets along with the other jumpers already being sent. A pattern for these new items is available in Church. Also anyone who is not a knitter themselves but who would like to help this appeal can do so by donating wool or money for wool to be purchased. See Isobel Murray for more details. A new monthly Bible Study will begin on the third Wednesday of each month for nine months (excluding July) commencing on Wednesday 20 February at 7:00pm in the Manse. Our study will be led by Stuart Gardiner. The Church Library has some more books - Please come and borrow some. Every day, in Africa, Haiti, India, Peru, Romania, Bulgaria, Croatia, Serbia, Sri Lanka, babies are born already infected with HIV or are very premature. Their families are so poor that the babies are sent home wrapped in newspaper as protection against the weather, hence the name “Fish and Chip Babies”. A group from St Andrew’s Church and their friends have been knitting jumpers and beanie hats. In January 2013, 103 jumpers and 51 beanie hats were collected ready for transportation abroad. These jumpers are invaluable because newspaper is now so expensive and difficult to obtain. If you would like to help these babies, please contact either Isobel Murray or Ann Madine.